We specialise in Mercedes audio upgrading. At Brian Car Sounds we have experience with all Mercedes models and classes. From A Class, B Class, C Class, E Class, G Class right through to the S Class and the more sportier SLK, SL, SLS and AMG models. Compatible with C Class / E Class / S Class vehicles. 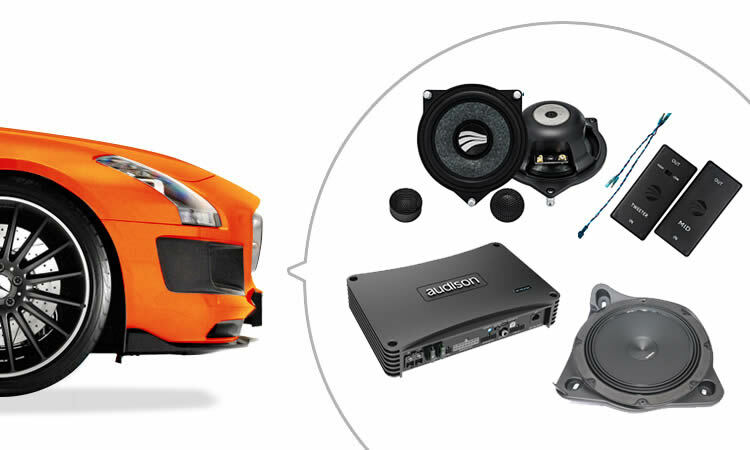 For this package we will offer you a richer sound for the whole vehicle by upgrading the front door speakers with Rainbow IL-C4.2C MB, 2-way component speakers, upgrading the under-dash subs with the Audison Prima Drop in 8" woofer upgrade. On all speakers we would be using an Audison Prima Forza AP F8.9-bit amplifier. Front Doors will be fully sound proofed to enhance the speaker’s quality. We allow a full day’s work for this package to be completed. With all cables, parts and everything we need to complete this job. Package starting from: £2,499 supplied and fitted. We have previously fitted the above packages to customers' Mercedes with banging results. If you'd like a custom package not shown here for your Mercedes, please feel free to call us on 020 8645 0655 or pop in to the shop for a chat about your ideas. We are always happy to oblige.